New research links weight loss to soluble fiber supplement intake. The bottom line: Research strongly supports the recommendation of supplementation with soluble fiber for people who are trying to lose weight. Most Americans do not get enough fiber. In fact, less than 50% achieve the recommended daily allowance for fiber. This statement should not be a surprise because most of us eat highly processed foods. Our grains are ground and processed to remove the fibrous husks. We prepare fruits and vegetables by removing your skin and other fiber-containing portions in order to make them more palatable in taste or appearance. In fact, according to the CDC, only 1 in 10 Americans get the recommended servings of fruits and vegetables per day which many dieticians feel is too low of a standard. Soluble fiber has beneficially affected metabolism and satiety. The most common dietary sources of fiber are cereals, fruits, and vegetables. Soluble fiber intake leads to increased satiety, improved blood lipid concentrations, and improved glycemic response. Examples of soluble fiber include psyllium (Metamucil) which is a fermentable soluble fiber. Fermentable soluble fibers have more metabolic benefits, but produce side effects such as gas production and bloating. Non-fermentable soluble fibers like Methylcellulose (Citrucel) do not cause gas production and bloating, but have less metabolic benefits. Fiber supplementation slows absorption and digestion of macronutrients so it may be a feasible approach to improve body composition and blood sugar in adults with overweight and obesity. I have to admit, I am not a big fan of fake fiber and would suggest food souces instead, but this research is very promising. 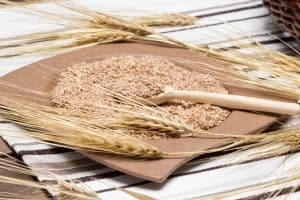 I wrote a prior article on the benefits of fiber intake for weight loss. I wrote both a fiber weight loss tip and research supporting an increase in fiber intake. Today, I am going to review another piece of research that further strengthens this statement. Today, There is strong evidence that dietary fiber intake is protective against overweight and obesity, but I have to agree that the results of prior studies have been mixed. Researchers published “Effects of isolated soluble fiber supplementation on body weight, glycemia, and insulinemia in adults with overweight and obesity: a systematic review and meta-analysis of randomized controlled trials” in the American Journal of Clinical Nutrition in December of 2017. The researchers evaluated prior randomized controlled trials of isolated soluble fiber supplementation in overweight and obese adults on outcomes related to weight management through body mass index, body weight, percentage of body fat, and waist circumference. They also looked at glucose and insulin metabolism through labs. The study is a systematic review and meta-analysis of 12 prior randomized controlled trials. The trials had 609 participants, and the duration was 2 to 17 weeks. The analysis revealed that soluble fiber supplementation reduced BMI by 0.84, body weight by 2.52 kg or over 5 pounds, and body fat by 0.41% when compared to placebos. Both fasting glucose and fasting insulin were also reduced. The bottom line: Research strongly supports the recommendation of supplementation with soluble fiber for people who are trying to lose weight. Isolated soluble fiber supplementation improves all body weight measures and metabolic outcomes in overweight and obese adults. This may indicate that supplementation may improve fiber intake and health in these individuals. “CDC Press Releases,” CDC, 31-Dec-2015. [Online]. Available: https://www.cdc.gov/media/releases/2017/p1116-fruit-vegetable-consumption.html. [Accessed: 21-Jan-2018]. Be the first to comment on "Research: Fiber supplementation helps weight loss."